How do you raise $1,117,155 in one night to support water initiatives in vulnerable communities? By auctioning off six precious and bespoke items, including a McLaren 570S Spider, a limited-edition Audemars Piguet timepiece and a voyage on the largest private residential yacht on the planet. A total of 1,800 guests witnessed this fundraising frenzy March 8 at the seventh annual One Night for One Drop, Imagined by Cirque du Soleil event sponsored by Colgate and MGM Resorts. The 90-minute show and auction took over the O Theater at Bellagio Resort & Casino in Las Vegas. The beneficiary, nonprofit One Drop foundation, provides access to safe water and sanitation around the globe, founded by Cirque du Soleil creator Guy Laliberte. Network television audiences will get to see One Night for One Drop when it debuts on CBS at 8 p.m. March 16, hosted by Entertainment Tonight’s Kevin Frazier and figure skater Tara Lipinksi. 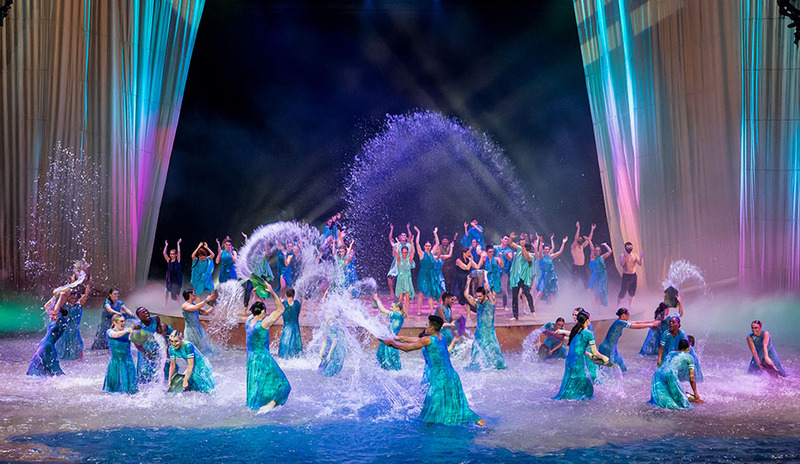 This splashy affair — quite literally, thanks to the aquatic flare of the O Theater — was written and directed by André Kasten and Leah Moyer, who choreographed Cirque shows such as Mystere and The Beatles LOVE. It featured a 90-minute acrobatic spectacle set to the music of Academy Award-winning, world-renowned score composer Hans Zimmer, who performed three arrangements live, including a specially adapted piece from Interstellar. Drawing inspiration from the principles of human connection, friendship, beauty, nature, love and loss, main character Everyman goes through a journey of enlightenment. While there are both pivotal moments and tumultuous times along the journey, his counterpart, Drop, personifies that the power of change begins within. In addition to Zimmer and singer Czarina Russell, the performance and party was attended by director and producer Nigel Lythgoe, host of CBS’ The Talk Eve, star of Second Wives Club Shiva Safai, General Hospital actress Lisa LoCicero and star poker player Daniel Negreanu. Las Vegas headliners from up and down the Strip came to join their Cirque du Soleil counterparts, including Marie Osmond, Xavier Mortimer, Tape Face, Carrot Top, Blue Man Group and castmembers from Absinthe, Magic Mike Live, Opium and Chippendales, among others. The creative team began working on the production more than six months ago to include Las Vegas headliners Blue Man Group and choreography created by Alexander Ekman and Andrew Winghart, as well as Keone and Mari from World of Dance. Prior to the entertainment, the six-lot live auction brought in $808,000, thanks to two prestigious pieces that were specifically created as one-of-one for the event — a bespoke McLaren 570S Spider by McLaren Special Operations, part of the 1 of 6 Racing Through the Ages collection, which raised $310,000. Going for $220,000 was a one-of-a-kind Audemars Piguet Royal Oak Selfwinding Chronograph timepiece, crafted in 950-platinum with a deep purple Grande Tapisserie patterned dial and platinum bracelet with an additional blue alligator strap. One Drop is a production of Active International and Addressable Media with executive producers Neal Weinberg and Omar Zabian; supervising producers Adam Hertzog and Patrick McManus; and produced and directed by Adam Hertzog and Tore Livia.